Hi. 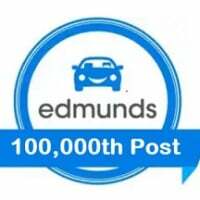 Can you please post the numbers for a 2015 Leaf SL with premium package leased for 24 months with 15k miles per year? Thank you! Looking for RV and MF for SL with Premium for 36 month lease with 10 and 12k in GA. May go with 10 if there is much of a reduction. Thanks for your help. 2015? .00003 MF and 39% for 36mo, 12K/yr. Not sure that Nissan offers 10K/yr leases, but if they do, the residual would be 1% higher. I see 48% RV in November in at least one post. Any idea why such a big drop? Thanks. If you saw a higher residual, it was probably for a shorter term. Anyone have the January MF and residual for a 2015 Leaf SL with premium package with 10k & 12K a year mileage for 24 & 36 months? Add 1% to residual for 10K. Can you please provide the current money factors and residual rates for 2015 Leaf S and Leaf SV in Washington State, Seattle Area in particular? I am looking for 10K/Year lease if they offer? .00003 MF and 38% residual for 36mo, 12K/yr. Thank you for your information. I went to one of the Nissan Dealer here in Seattle are and this is the offer i received for 2015 Leaf S without quick charge port. What do you guys think? Is this a good deal? I am trying for more NMAC Rebate. Their print ad says 3500 NMAC rebat. But that's for purchase. How much due at signing, outside of the first payment? Just the dealer fees/doc fees $350. Under $200/mo. What's not to like? As long as you can live with "range anxiety "
Thank you for your feed back. The range anxiety is always there. But this car is maily for city driving less than 60 miles/day. Could you please post the Money Factor & Residual percentages for the month of March? Do the following calculations seem right to you? Am I missing something? I'm only a few pennies off from your numbers ... the math looks good. I have two friends who are leasing Leafs here in the Seattle area and they just LOVE them. One is on her second Leaf lease. I can't get over the 9500.00 credit! For someone who needs an around town car I don't know how they could pass this up! No sales tax in Washington either! Just for comparison, could you please provide the numbers for a 24 Month lease with 10K & 12K? Hey Michaell, can you provide the latest lease incentives as well as24 and 36 MF and residual for the 2015 Leaf SL? Thanks in advance!